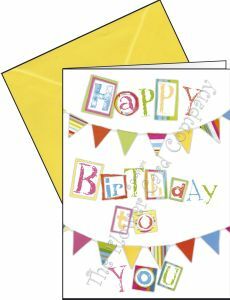 A pack of 5 Birthday Bunting Gift Cards. Each card is individually wrapped in its own cello sleeve with a colour coordinated envelope. Card size is 11cm x 15cm. Text on the front of the card is 'Happy Birthday To You'.